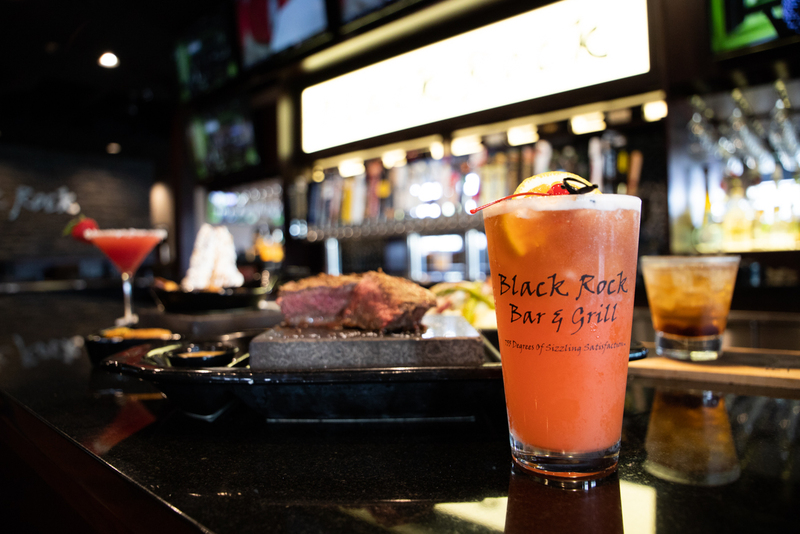 Black Rock’s popularity is evidenced by the eatery’s selection as the winner in three categories of the My City Magazine 2018 City’s Choice Awards: Best Fine Dining Restaurant, Best Ambiance and Best Dessert. And the menu does not disappoint! 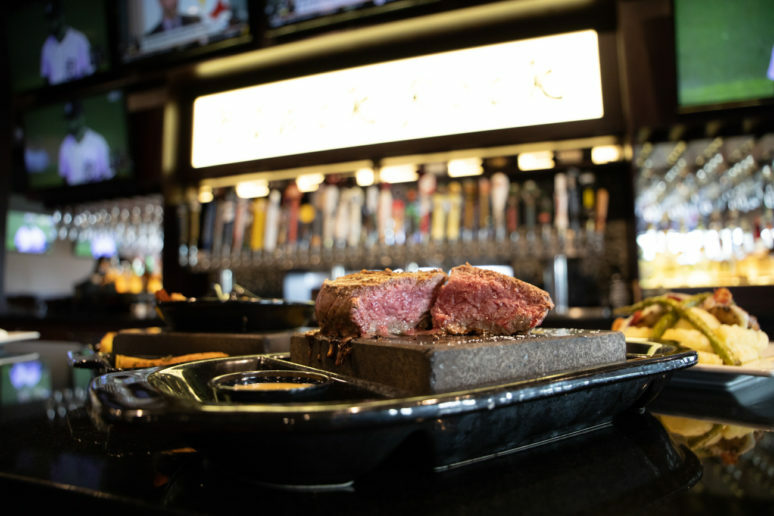 According to Simonovic, their award-winning signature steaks include sirloin, filet, New York strip and ribeye, all served on the hot stone. 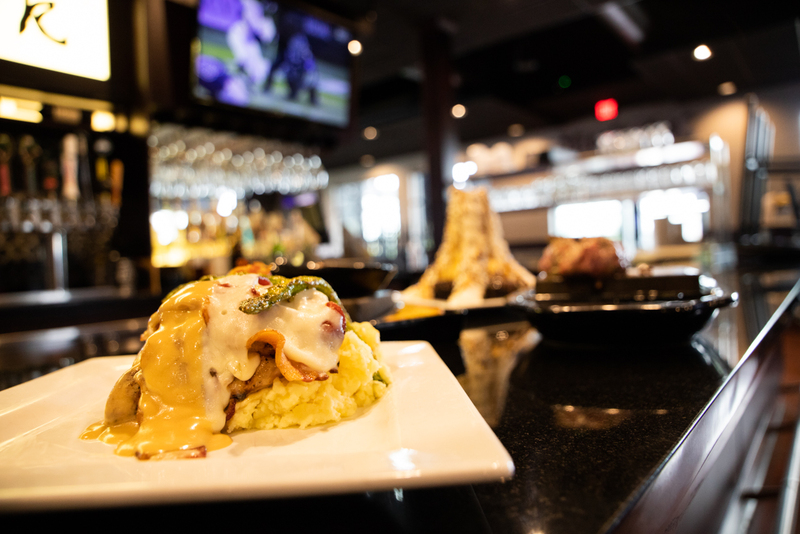 The menu also features a variety of seafood, including: seared Ahi tuna, scallops, jumbo shrimp and lobster tails. There are four mouthwateringly delicious, sizzling combination plates: Steak & Rib Combo, Steak & Chicken Habanera, Steak & Lasagna (served in an iron skillet) and Land & Sea (a 5oz. 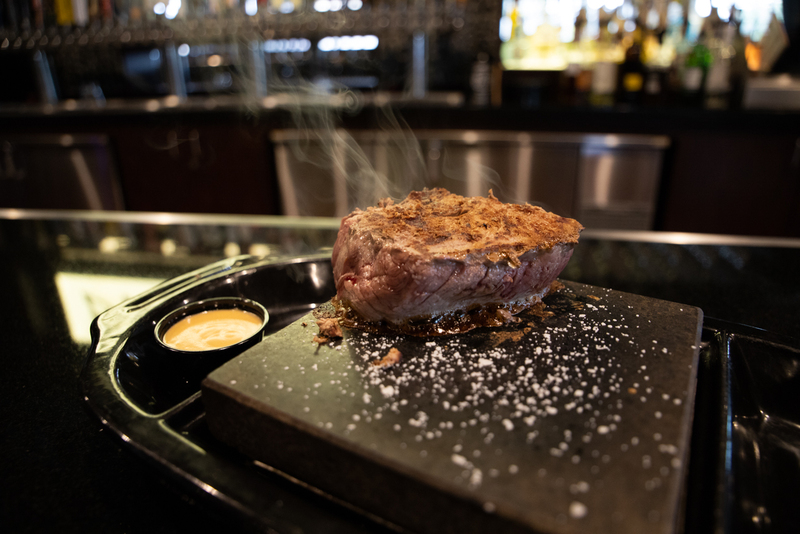 signature sirloin served with blackened white fish). So, how long do you cook the meat to achieve rare, medium-rare, medium, medium-well or well-done? Your server will tell you, help you cook it, or have it cooked in the kitchen, should you so desire. There are, of course, several delectable side dishes to choose from such as butternut squash puree, wild rice, creamed corn, and asparagus, to name a few. Diners can also enjoy some unique appetizers. 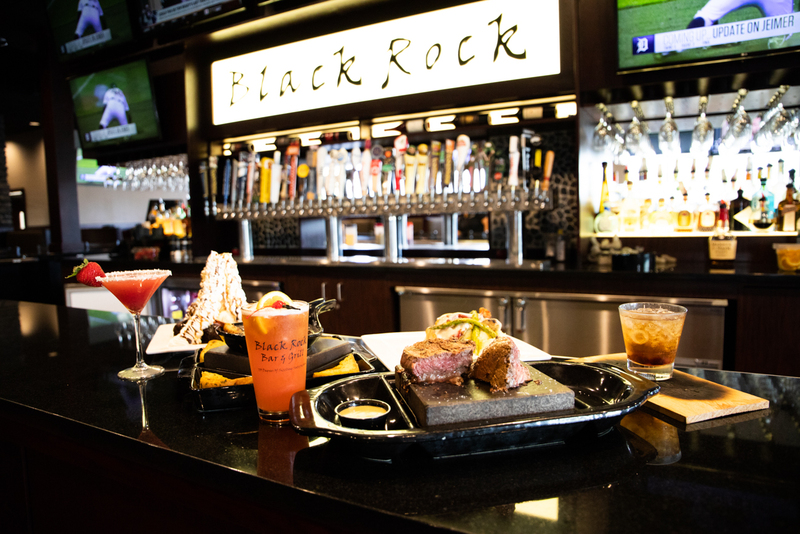 A customer favorite is the Black Rock Dueling Pretzel & Cheese Fondue™: soft pretzels served with house-made, white garlic cream cheese and a nacho cheese fondue that comes to your table piping hot on the volcanic stone. 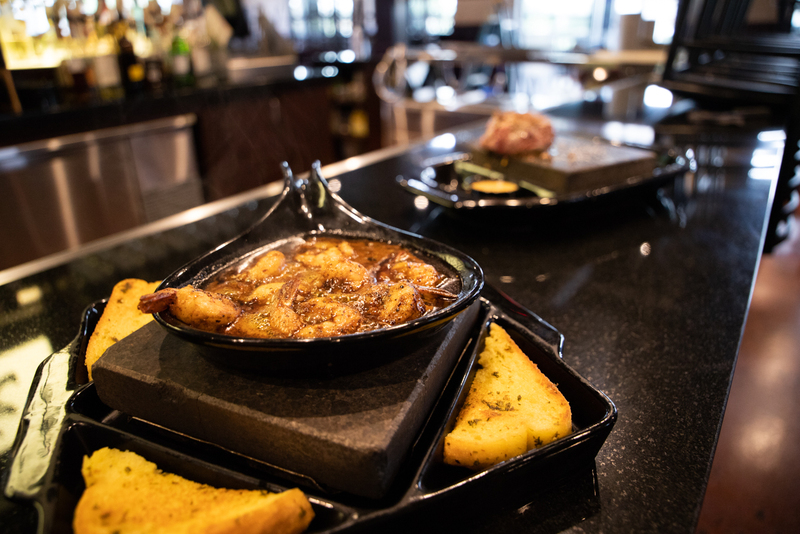 The Bubbling Shrimp™ is also very popular – large shrimp sautéed in the chef’s special Cajun butter sauce, served with toasted garlic bread for dipping. “It comes in a skillet on top of the rock, bubbling hot!” exclaims Simonovic. Looking for a lighter meal? The Lettuceless Greek™ Salad (red onions, tomatoes, cucumbers, bell peppers, roasted beets, Kalamata olives, pepperoncino, Feta cheese and fresh dill tossed in Greek dressing) is flavorful and delicious. rock on which the meat is cooked, right at your table. 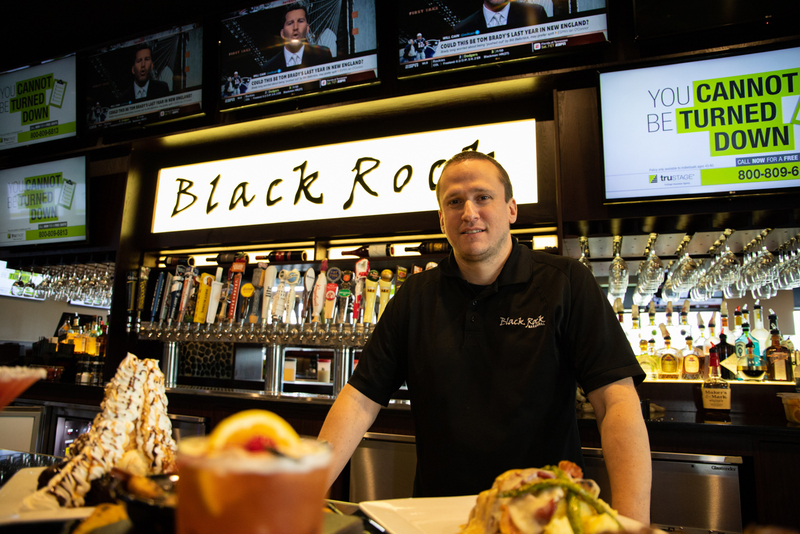 An enthusiastic staff helps make the Black Rock experience one to remember. 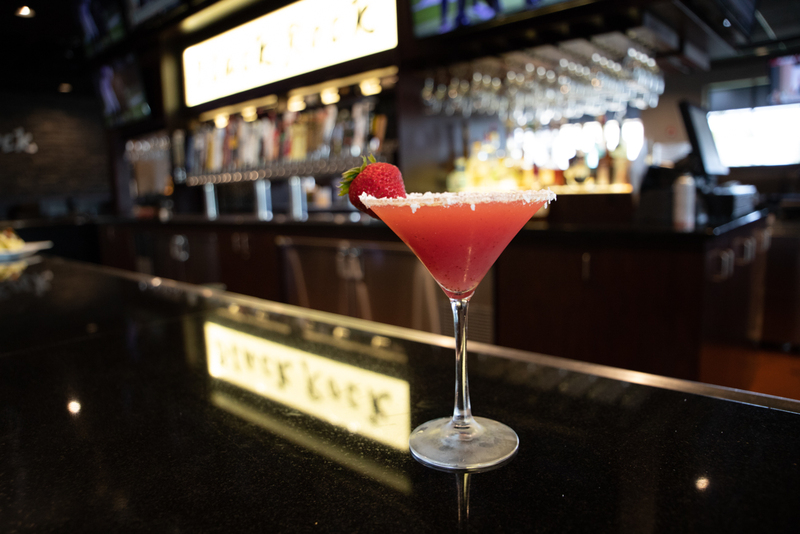 “It’s a great place to work!” exclaims server, Kelly Smreka. 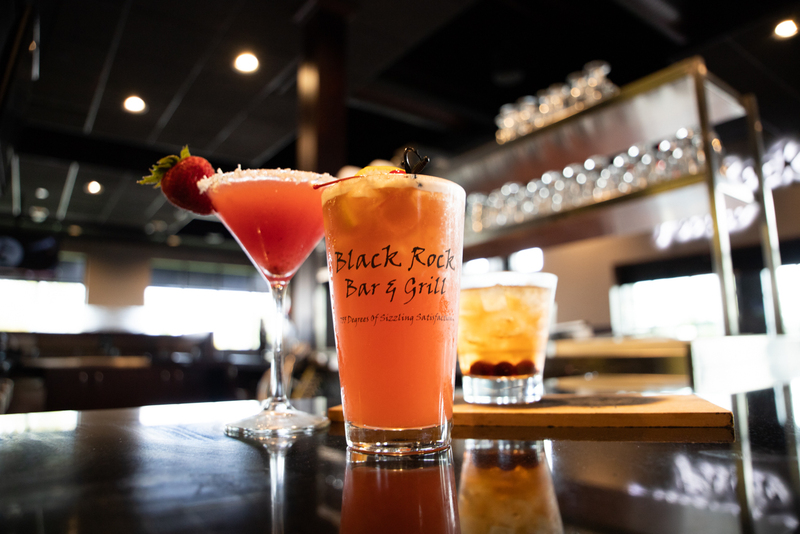 “You couldn’t ask to work for better people.” Davison resident, Jen Ashley, has tended bar at Black Rock since the day it opened. 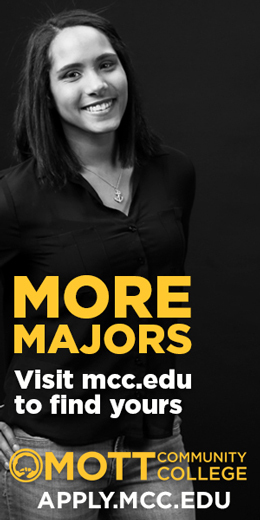 “I really enjoy coming to work every day, and that’s important,” she admits. The full-service bar offers craft cocktails, 32 beers on draft and an extensive wine list. 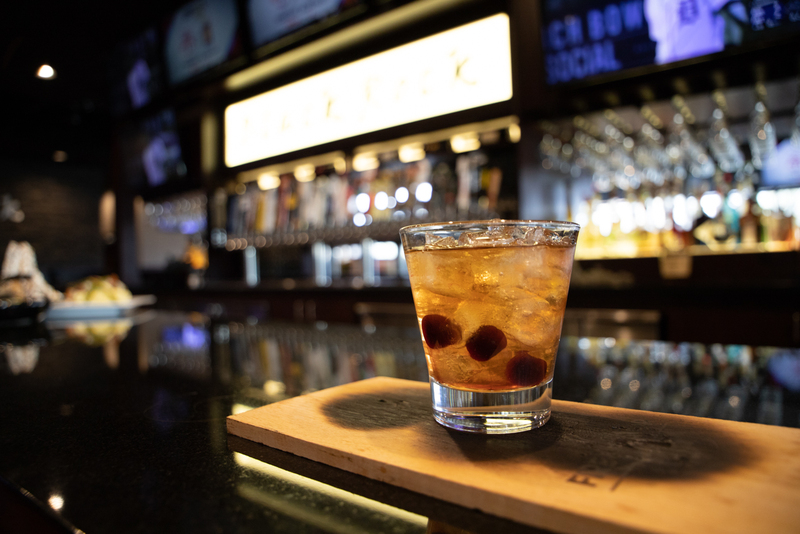 Their signature Smoked Old Fashioned combines Maker’s Mark Bourbon, cane sugar and cherries in a cedar-smoked glass. 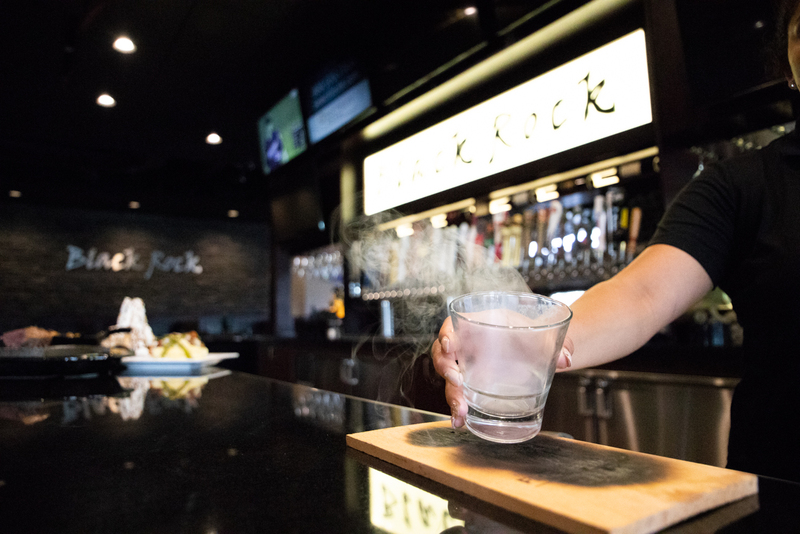 “It’s really cool to see the bartenders make it,” says Simonovic. 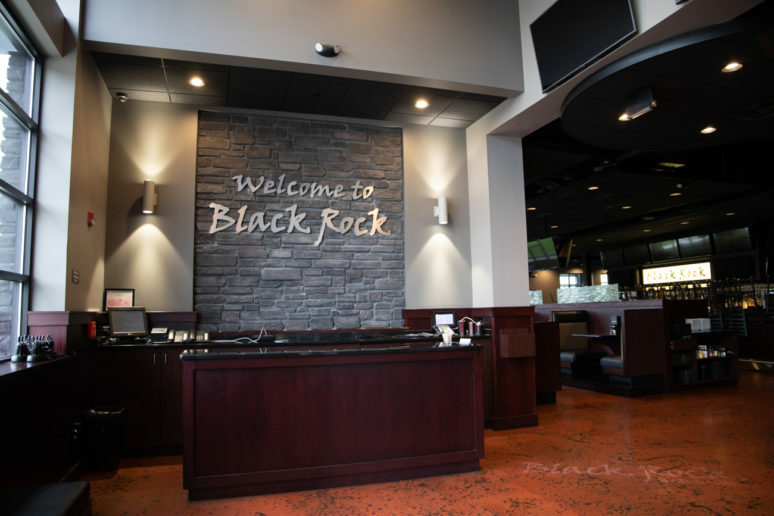 Black Rock offers a board room that holds up to 30 guests for business meetings, showers, birthday parties and celebrations of any kind. The glassed-in room features a glistening, black table with leather chairs and a screen for presentations. 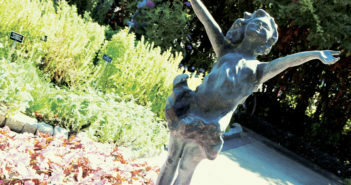 There is also an enclosed patio with doors that can slide open in pleasant weather.